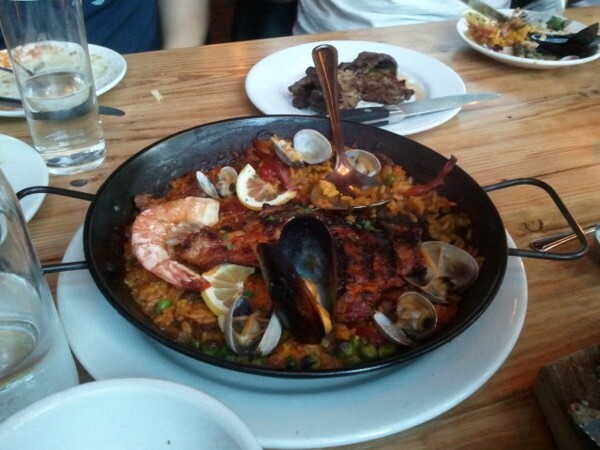 The paella at Toro Bravo (an old favourite from trips to Portland past). After all the amazing food we enjoyed during our weekend jaunt to Portland, it's a wonder my jeans still fit now that I'm back in Vancouver! From food carts to gourmet restaurants, one of the main highlights of every trip we've taken to Portland has been of the gastronomic variety. The boy and I introduced our friends to longtime favourite Toro Bravo, but we made sure to make time to check out new restaurants too, starting with a pit stop in Bellevue to sample the xiaolongbao and steamed dumplings at Din Tai Fung. The lineups at this famous Taiwanese dumpling chain started before the restaurant even opened. Riffle NW was recommended to us by the boy's sister-in-law, and we weren't disappointed. The catch-inspired seafood restaurant located in the Pearl District had some of the freshest, most flavourful oysters I've had in a long time. The halibut and dockside chowder I ordered were nothing to sneeze at either. And finally, I love the feeling of randomly discovering culinary gems in a new city: walking into an unknown restaurant, reading the menu, grabbing some seats. That was exactly what happened at Eat Oyster Bar, which was a couple doors down from a brunch spot we didn't feel like waiting two hours for. A build-your-own Bloody Mary bar, a live band, Cajun-inspired cuisine, and oysters on the half shell—so good. I ordered a soft shell crab po'boy, which I'd only ever read about but never tried. The sandwich arrived and was just as dramatic-looking in person as what I'd pictured in my mind: two soft shell crabs deep-fried whole and served on an open-faced sandwich. This was more food than I could finish on my own, but everyone else at the table was glad to sample some fries and a crab leg or two. If you're thinking to yourself that all I did in Portland was eat—well, you'd be partially right. But the food was so good! And I promise that later in the week, I'll show you non-food glimpses of Portland and what I wore to disguise my ballooning waistline. That all sounds so delicious! Thanks for sharing your finds....I may have to go back to Portland sooner rather than later! It's better going with friends so you can try a whole bunch of dishes, especially at a tapas place like Toro Bravo! My husband use to work in Portland's shipyards many years ago (my husband an a structural/ocean engineer), but we haven't been back to Portland in - forever! With all that great food .. we'll have to visit quite soon!